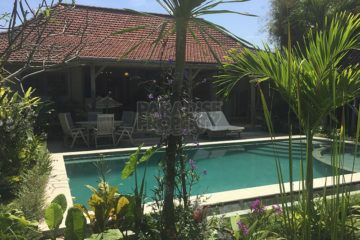 Villa Umalas Tunon provides a peaceful space for ultimate relaxation whilst ideally located close to all the tourist necessities of neighboring Seminyak, that seems to melt more and more into the Kerobokan area This popular area of Umalas is only a stone’s throw away from the world class beaches of Seminyak and Berawa. These lively beaches are simply bursting with activity as locals and tourists congregate to play music, surf, and kick a football across the glistening sands. 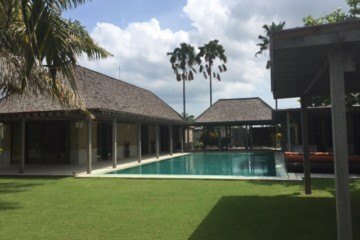 The villa consists of 3 bedrooms including a master bedroom which overlooks the swimming pool and bale (gazebo). Another 2 bedrooms are situated on the second floor, complete with a large balcony. There is a spacious, closed living and dining area and a well equipped kitchen with a breakfast bar. 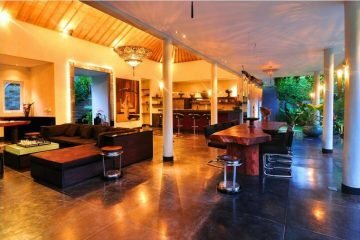 The villa has a very cozy ambience with the use of warm timber finishings throughout the property. It is the perfect family home. Price excludes outgoing costs such as electricity, maid and Internet.